China keeps expanding its territorial claims in the Pacific. They stretch all the way to Malaysia now. On March 25, Malaysian authorities detected about 100 Chinese fishing boats, encroaching on waters near the Luconia Reefs or Shoals, which Malaysia administers. The flotilla of boats, cleaning out all of the game fish on the reefs, were protected by two Chinese Coast Guard vessels. Malaysia's navy monitored the situation, threatening legal action if the boats trespassed into its exclusive economic zone. China's Foreign Ministry again reiterated Chinese fishing boats' rights to operate in the area. In times of war or crisis or as directed, Chinese fishing boats come under the control of the navy. They have mounts for machineguns and places for depth charge racks. They receive orders, weapons and ammunition from the Chinese navy. 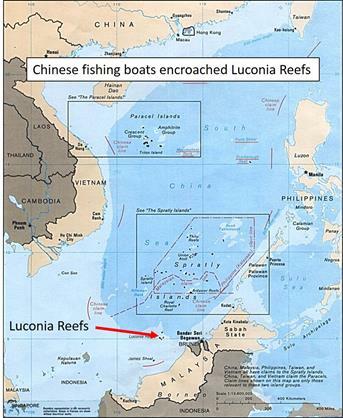 The Luconia Reefs are more than 1,200 miles from mainland China and 60 miles from the Malaysian state of Sarawak. This incident reinforces our judgment that China can be expected to challenge every disputed claim in the South China Sea with a show of force. The Luconia Reefs are rich fishing grounds. Extensive fossil fuel deposits reportedly lie under the seabed. I expect that the Chinese will soon be building an "artificial island - then an airbase" on the reef. 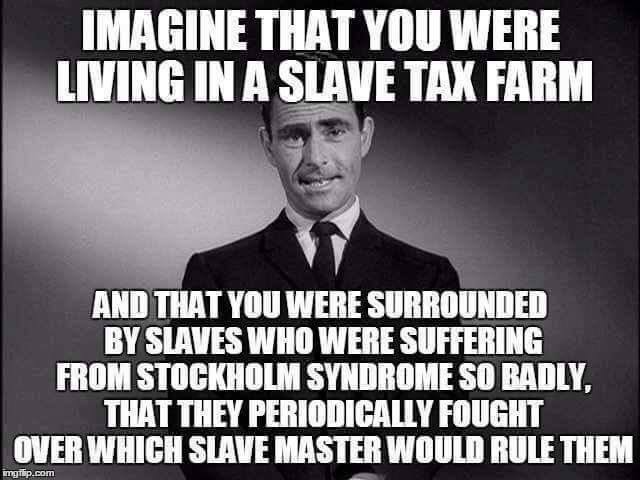 That's their pattern. This is the second confirmed instance that a Chinese Coast Guard ship that was guarding fishing boats entered Malaysian claimed waters around the Luconia Reefs. The prior incident occurred in June 2015. There have been some rough exchanges between Malaysians and Chinese fishing boats, but no actual violence. While I don't think that America has an interest in being the "world's policeman" and if Malaysia wants to allow China to walk all over them (as the Chinese are want to do), it's up to them. However it's good to keep in mind that China's territorial interests keep expanding and they back up every move with military force. The time will come when Malaysia or Japan will decide that enough is enough and will sink a few of the offending Chinese fishing boats or coast guard warships. US is still a member of SEATO (Southeast Asian Treaty Organization), and that will draw us in -- unless it's during the Obama presidency... He'll fly to a communist country and party. The novel (note the bar to the left) is through edit and publication is pending. I am flattered that some of the people who read this blog have e-mailed me and asked how to get a copy. I will advise when the work is available in book stores and on-line. It's a different sort of novel for me, designed to appeal to a broader readership than the work I've done before. Tag Line: Sparks fly as two star-crossed lovers meet. He runs toward trouble as she yearns for something missing, and it ends in a flight from and toward justice. The 93,500 word novel, set in the early 1990’s, is told from different first person perspectives. In a sense, it is a coming of age story wherein the principal characters, Sean O’Bryan and Jessica Baker are joined in a backdrop of intrigue as they simply attempt to live life. Sean, on a journey to be his own man, joins Satan’s Legion, a motorcycle gang in Southern California. Jessica, adrift as a stranger in a strange land, joins him in the gang as they try to work out who they are as individuals and as a couple. 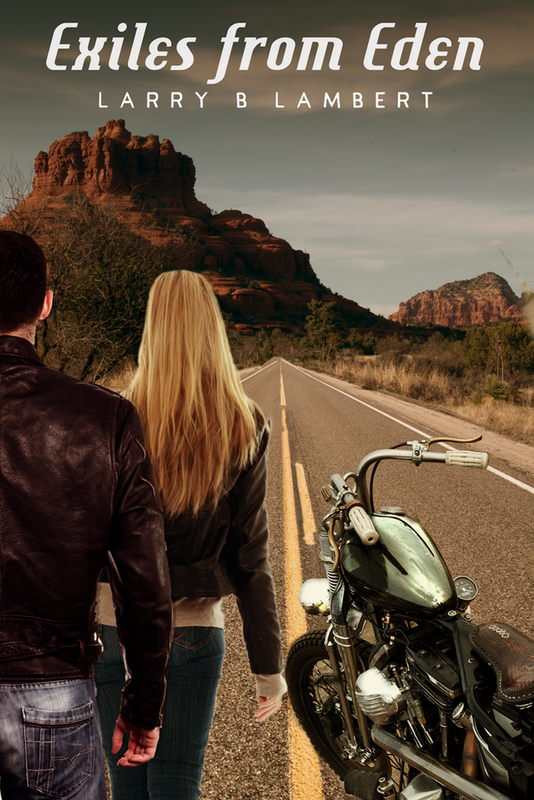 As their need to join the criminal world completely becomes more pressing, Sean and Jess don’t realize that what they say is being recorded and what they plan to do is part of a larger net that is dropping over them. While justice is about to be served, compassion by the undercover police officer in their midst sets the wheels in motion for their escape. Jessica, wanted in England for a crime that she did not fully commit and their involvement with Satan’s Legion culminates in a flight to the Boneyard, in the most unlikely place. Fellow blogger, Lone Star Parson, will be making suggestions to me as to where to find the perfect spread in Texas (which must include a rifle range, access to the Brazos or in the alternative, a bass pond -- or both) as I take the Ford Raptor to Texas for the first time. Plans include fishing and a possible razorback hunt as I visit the compound, LSP and his faithful dog, Blue Avenger, etc. Sadly, it's a busman's holiday and I need to do a little bit of work as well as hanging out and shooting. Taxes are lower in Texas than they are in the People's Republik of Kalifornia. That and a rifle range on the property (and private bass pond) combined are a powerful inducement. Maybe a second home is called for? At the moment, I'm thinking of vacant land that I can build on. A friend suggested that I invest in a trailer home while the main hacienda is under construction. I said, "ARE YOU NUTS?" A trailer in Texas draws tornadoes like a pecan tree draws cicadas, or a swamp draws mosquitoes. Or maybe I need to re-think Durango, CO? Maybe I need to make yet another pilgrimage up HWY 550 through the San Juan range? 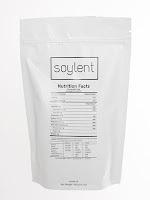 Yes, there is a company https://www.soylent.com that appears to be making various types of beverages and powders for human consumption. I read over their website and did not read that they are relying on human parts. There is no indicated collusion with Planned Parenthood, though I did not read a denial that they are collaborating. 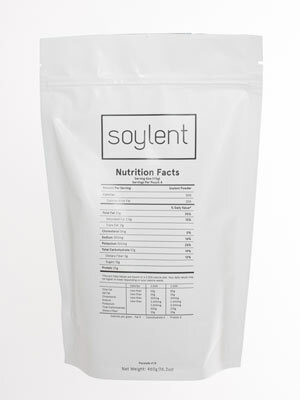 However, how could you possibly come out with a product called SOYLENT without evoking the popular film from 1973? When you are dead, you don't know that you are dead. It is only difficult for those who were in your life.